Is 3D printing eluding you? Still not sure what it’s about or if it will affect you? Well, it’s here to stay, and could well be in your home within the next couple of years. The Industrial world is not ignoring it that’s for sure. 2018 saw 3D printing gain ground as industries of all kinds added 3D printing – aka Additive Manufacturing – to their processes. Forbes released data to show that 90% of companies who had included 3D Printing in their business considered it to be a competitive advantage. The Additive Manufacturing industry is in a boom state. A recent Wohlers report showed the industry grew 21% to $7.336billion in 2017. Having already grown by 17.4% in 2016 and 25.9% in 2015. It’s an exciting time to be involved and discovering the capabilities of 3D printing. Be all this as it may, how will 3D printing affect you this year? Here are 5 key trends in 3D Printing ready for 2019. We don’t mean printing in hemp or cotton either. Oh no. We’re talking something far more advanced than that. If you’ve read our blog, you can 3D Print that? 5 Concepts Being 3D Printed Right Now, you’ll know we discussed the possibilities of printing human tissue and living tattoos. That science is now moving on quicker than ink can dry. 3D printing tends to involve scaffolding (included within the print) to hold the print up. This technique makes for a more useable shape. It’s one that, in 2018, saw the printing of organs. There’s also been progression in the printing of bacterial cells held in hydrogel suspensions. 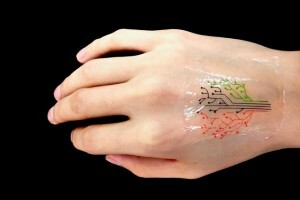 And in creating further wearable tech. Through DLMS (Direct Laser Metal Sintering) we can create lighter metallic items in higher production. For example, 3D printed seats on planes (in research as we speak) which are up to 50% lighter than current ones. Would this mean cheaper air flight? Unlikely, as the savings won’t get passed on! Nike has already begun 3D printing metal cleats for footwear. 3D Metal printing will make its way into your home, in the next couple of years. Production of desktop 3D printers is happening now – albeit in its infancy. One such company is iro3D. Sergey, who owns the company, created, developed and researched the printer. For $5000 you could be on your way to printing metal items at your kitchen worktop. But, to be honest, you’ll also need a baking kiln with the printer so not so practicable as yet. Metal printing at home offers much potential. You could, in theory, re-print faulty parts of electronic devices, washing machine spare parts or even your front door key. The day will come, and not in the too distant future, when you will be able to buy shoes designed to fit your feet, and only your feet. Already, 3D Printed insoles are available. We featured Wiivvit last year, as they create insoles for runners. We also featured Snugs who make 3D printed earbuds. After scanning the inside of your ear they 3D print an earbud to fit. 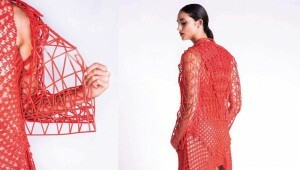 3D Printed clothes are progressing, from fashion statement, architectural pieces, to wearable clothing. Danit Peleg designed her latest collection, and 3D printed it herself. With one aim: that it be wearable. The collection took over 2000 hours to print. The faster a 3D printer works, the more it vibrates. That’s part and parcel of 3D printing however vibrations can cause flaws in a print. That’s why we slow 3D printing down, to reduce vibration and hence flaws in the finished product. Now, scientists at the University of Michigan have found a way to remove most of the vibrations in 3D Printing. By applying something known as ‘filtered B-spline’ algorithms to printer-controlling software, the scientists/algorithm, can anticipate which part of a print job will cause the biggest vibrations. With that knowledge it adjusts the printer to compensate for them. By reducing the vibration of the printing, it’s possible to reduce the print time. Now, imagine you create a niche item. You can produce it en masse in record time. How our expectations continue to change eh? 2019 will see the 5th year of the 3D Food Printing Conference, held in the Netherlands. The conference will show that 3D food printing continues to grow. Already supermarkets are looking to create customised cakes. Meanwhile, many restaurants use 3D printers to create custom food items or decorations. Chocolate and pizza are already mainstay items of the 3D printing world. 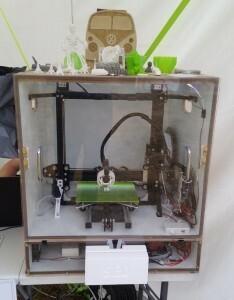 In October 2018, 3dPrint.com, reported on Giuseppe Scionti a researcher from Milan, currently working with Barcelona’s Polytechnic University of Catalonia. He has 3D printed ‘faux’ chicken and steak. 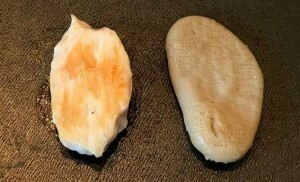 Using raw vegetarian meat substitutes, or as 3dPrint.com put it, ‘straw coloured paste’, he has created a chicken steak with a tofu like texture. The 3D printed ‘chicken’ is on the right-hand side of the image – the pallid looking shape. It needs a bit of colour methinks. It’s not what you’d call appetising is it? With 3D printed food can we reduce food waste? Will we print only what we need to eat? Is a 3D food printer going to be the must have item for the up-to-date home? Y’know, in the same way that the microwave oven was in the 70s? There’s no denying the effect 3D printing will have on our lives. And it’s coming sooner than we think. With 7% of the general public looking to buy a 3D Printer in the next 12 months, we can expect more innovation. Do follow us on social media and keep up-to-date with our 3D printing adventures. We’re on Facebook, Twitter and Instagram. Come and see us there and say hi!